On a recent fall afternoon, a group of high school students enrolled in Salish Kootenai College’s Science Research class are bent over lab tables, deep in concentration. Their instructor, Taylir Schrock, circulates around the group. “Massage the smeg!” she urges. The students, all participants in a unique STEM-focused dual enrollment program, know what to do. Using precision instruments called micropipettors, they mix samples of Mycobacterium smegmatis, also known as “smeg,” a bacterium that tiny viruses called bacteriophage prey upon. The immediate goal is to isolate and purify phage from local soil and water samples, then analyze the viral genome. Phages are an integral component of the earth’s ecology and represent potentially important therapeutic agents for antibiotic-resistant strains of bacteria, yet relatively little is known about their diversity and evolution. The larger goal, however, is to build interest in math and the sciences among students enrolled in reservation-area high schools. 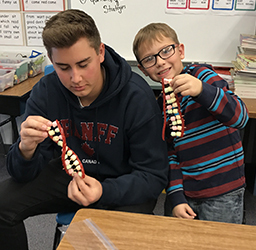 Started in the fall of 2017 with funding from the National Institutes of Health, the mission of the Salish Kootenai College STEM Academy is to increase the number of Native American high school students who are prepared for college academic majors in STEM fields. This is accomplished by promoting a culturally relevant, supportive learning environment; enhancing college readiness skills; and providing exposure to college and university experiences at Montana campuses. Salish Kootenai College, located on the Flathead Indian Reservation in western Montana, is the first tribal college to establish such a program. Authentic scientific research is a central component of the dual enrollment program. While research is now commonly incorporated into undergraduate learning, the STEM Academy was the first to include high school students in the prestigious Science Education Alliance Phage Hunters Advancing Genomics and Evolutionary Science (SEA-PHAGES) program, developed by scientists at the Howard Hughes Medical Institute and the University of Pittsburgh. As part of their work, the group annotated the entire genome of a bacteriophage the students named “Bones,” which was discovered by Polson High School student Nathan DePoe, who collected his soil sample containing the phage near a bird grave. Such project ownership is a hallmark of the program, and keeps the students engaged. Academy students Savannah Houle, also from Polson, and Geraldine Trahan, a Two Eagle River School student, later presented their SEA-PHAGES research to fellow “phage-hunters” at a culminating scientific symposium at Howard Hughes Medical Institute’s Janelia Research Campus in Ashburn, Virginia in June of 2018. 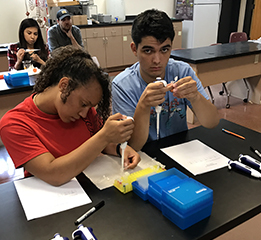 In addition to discovery-based science research, first-year STEM Academy students complete core coursework in biology, chemistry, and statistics to prepare them for specialized study the following year. In their second year, the students develop an independent research project under the guidance of a faculty mentor. For her research project, student Savannah Houle, a senior at Polson High School, is investigating the impact that veteran parents who have experienced PTSD have on their children, both in terms of their personality and mentality. The choice of topics stemmed from her own personal experiences, and she appreciated the latitude she was given to explore the issue. “I have the freedom to go in whatever direction I want to,” she said. Prior to the first day of classes at the college, students participated in a month-long bridge program in order to acclimate to the college campus. The experiential schedule included applying conversion factors to a Tollhouse cookie recipe as an introduction to chemistry, participating in a cultural site visit to Chief Cliff and Black Lake to collect environmental samples for the Science Research class, learning about study skills, such as metacognition and time management, and touring the St. Luke Community Hospital in Ronan. Local Native STEM professionals such as researcher Dr. Vernon Grant (Blackfeet) and the University of Montana’s Community Research Assistant Niki Graham (Salish) also offered their perspectives and paths as leaders in their fields. Both have dedicated their careers to helping others in their Native American communities and thus serve as role models for the next generation of aspiring scientists. The STEM Academy regularly partners with local institutions to expose students to the wide variety of STEM-related careers that exist. A spring visit to the University of Montana’s Flathead Lake Biological Station allowed Academy students to meet scientific professionals and gain a better understanding of local ecology. 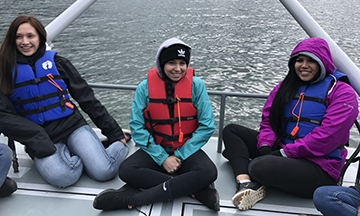 As part of that trip, students traveled to the middle of Flathead Lake to collect water samples at a variety of depths, filter out plankton, and record measurements of the water’s clarity. They then returned to the biological station two days later to complete a DNA lab testing for a phytoplankton gene at various depths from the water samples. The Academy emphasizes this kind of hands-on, place-based education to promote a culturally-responsive learning environment, which reflects Salish Kootenai College’s mission to perpetuate the cultures of the Confederated Salish and Kootenai Peoples. Outside of class, Academy students also provide outreach to local elementary, middle, and high schools to improve their communication of basic scientific research, generate enthusiasm for STEM-based research in a younger audience, and provide peer mentoring. Last year’s cohort had contact with approximately 1,000 students, family members, and local community members during visits to the schools, as well as community events such as Ronan Family Science Night. Though young, the program is constantly evolving, said Andrea Panagakis, STEM Academy Program Coordinator and SKC science instructor. “We try to be receptive to each student’s individual needs, retaining what works and modifying what doesn’t in order to support their continued success.” The STEM Academy students are excited by the opportunity to experience college life with likeminded individuals, and their presence has had a positive influence on SKC students in return.